10 inches tall Russian Santa - Grandfather Frost - always comes for Christmas holding light. 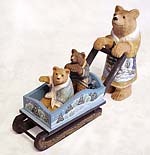 Very nice Christmas decoration of she-bear sledging her two bear-cubs. Solid linden carved 4 figures. She-bear is 8 inches tall. Water-color and tempera painted. Traditional men's Russian hat decorated with funny fllower. Looks very smart! Very nice at festivals, for Russian dancers or singers. Russian traditional transformer ear flap hats widely spreaded and very popular on huge and cold territory from Siberia to Baltic sea. Beautifill wooden carved Russian Santa GRANDFATHER FROST will come to your Christmas tree from north and bring his best friends - Snow-maiden, Moose, Deer, Bears and Penquins! The best Russian matreshka doll artists handmade those gifts for you and the famous painters placed real fairy tale topics on them! Unique blocks of polished crystal with beautiful 3D images inside - the result of artwork and laser technology. Mostly used as paperweights these crystals are really beautiful under the sun light! Beautiful 50x50" warm Russian goat wool shawls handmade by the acknowledged masters from Orenburg where knitting tradition have been growing up since ages. Great choice of different colors. Traditional costumes created according to 18th-19th centuries fashion of different regions of Russia - any size from children to adult, men and women, and a great choise of colors. Specify your keywords in “Search” form and go on with your purchase online. Choose the categories you are interested in by browsing the catalogue on the left. Collect items into your basket, edit its content and calculate the total. Enter your name, password and email address and check out your order! Use your credit card or checking account to pay online with PayPal. View your order status online collected, packed and sent out! We accept payments via PayPal online!